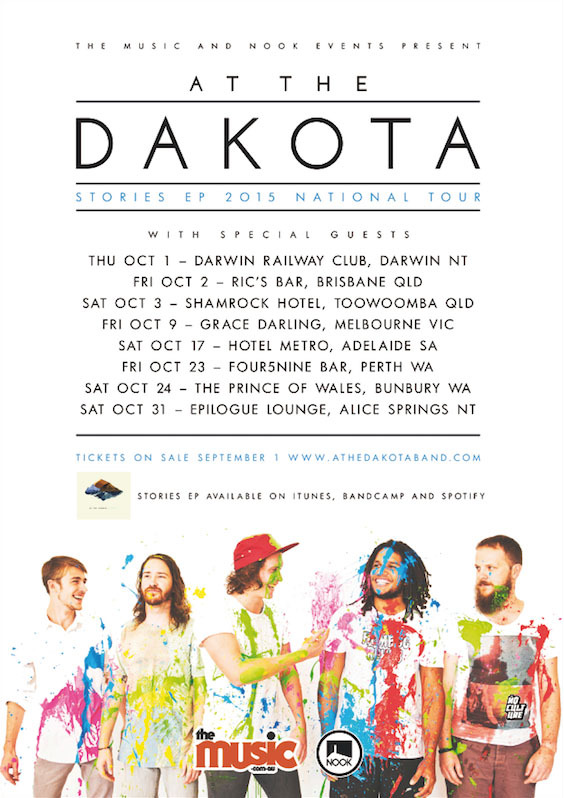 Hailing from Darwin, in the sunny Northern Territory, indie-groovepop five piece At The Dakota have forged their way in the local scene with their addictive pop sensibilities and hooky, quirky lyrics and melodies. With plenty of maximum capacity shows, feature artist spots and a massive EP launch in July, the band will embark on a national tour in October presented by The Music and NOOK Events in support of their debut EP release Stories. Upon returning home, they’ll round out 2015 supporting The Rubens in November at Discovery, Darwin. Stories features the award-winning single Stumptail (People’s Choice - NT Song of the Year 2015) and Hot100 Darwin Feature Track Peach Hat. Stories is available now from iTunes.